Shoes. Toys. Plants. The mail. While your new small breed puppy may want to eat everything in your home, there are certain nutrients that his little body actually needs to grow and thrive. Puppies, especially small breed puppies, burn energy faster than larger dogs, so they need a nutrient-dense diet that’s rich in animal protein. High-quality meat, poultry or fish should be the first ingredient. Grain-free carbohydrate sources, like peas and lentils, can also help provide sustained energy. DHA is an omega-3 fatty acid found in mother’s milk that helps support puppies’ eye and brain development. Folic acid is an essential B vitamin that helps promote cellular and neurological development. It can be found in puppy food as a supplement or naturally through ingredients like spinach and liver. Look at the other ingredients listed. Are they high quality and nutritious? Nutrient-packed superfoods, like salmon oil and flaxseed, can provide essential fatty acids and antioxidants to help support strong immune systems. What’s the point of all these healthy ingredients if your puppy won’t eat it? Look for ingredients you know dogs love, like organ meats. Another sign of sensational taste? Baked kibble! 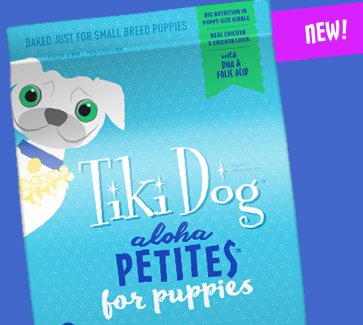 When kibble is baked, like Tiki Dog™ Aloha Petites™ for Puppies, the surface caramelizes, giving it a delicious, fresh-from-the-oven flavor. Ok, so this isn’t an ingredient, but it’s important! Your pint-size pup needs kibble he can easily eat. Tiki Dog™ Aloha Petites™ for Puppies, for example, is bite-size for the smallest of bites. Small kibble is also quick to rehydrate with water or wet food, which can help ease a puppy’s introduction to solid food. We hope this helps you find the best puppy food to help your tiny pup grow “big” and strong!